Note the new framed movie posters on the wall, which my boyfriend huffed and cursed but finlay got them all up straight! 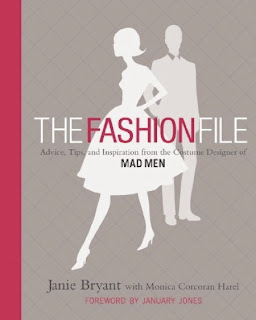 I have been reading Mad Men, The Fashion File by Janie Bryant. I am convinced it will change the way i dress forever! It is a brill book full of useful hints and tips from the costume designer for Mad Men, Janie Bryant. 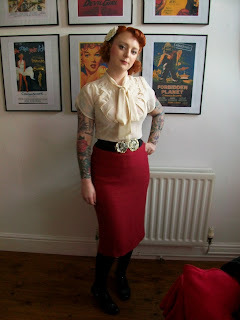 The choosing of this outfit, mainly the skirt, came from the section about colour. She splits it up into seasons based on complexion, eye colour and hair colour. With my pale skin and newly dyed red hair. I find myself between Spring and Summer. Janie suggests jewel tones for my skin and hair colour, just like the lovely Joan Holloway. So when I spied this skirt at the boot fair yesterday, i though aah hhaa ruby! snap! i was wearing that exact shirt today to the office! best thing i ever bought from primarni! love thw skirt too, lucky you! Glad you can join me! I have been reading blogs for over two years. Just started to really get mine going last week and love it!